Student Association President Alexandra Curtis recalls her first days on campus during the Chancellor’s Convocation for new students. Alexandra Curtis ’14 sat in the Carrier Dome three years ago with her Flint Hall roommate, captivated by the words of the Convocation speakers. After hearing from the Student Association president, she turned to her new friend and said “I think I want to do that one day.” Curtis went to the student government office, met the staff and immediately felt at home. On Friday, she was the one addressing the Convocation audience as Student Association president. 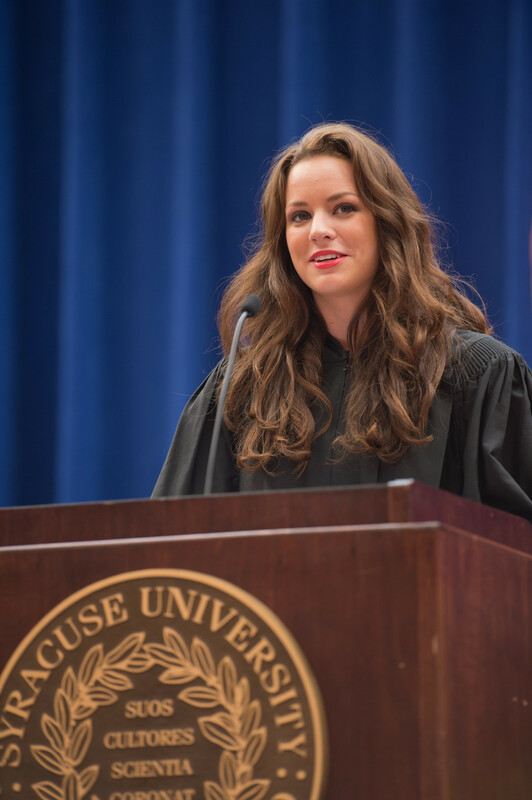 Her dream became reality and, in turn, her lesson to Syracuse University’s newest students. Curtis challenged students to get involved. SUNY College of Environmental Science and Forestry President Cornelius (Neil) B. Murphy Jr. also spoke to the gathered students, who included ESF’s Class of 2017. Tadodaho Sidney Hill of the Onondaga Nation, Haudenosaunee Confederacy, gave a thanksgiving address in his native language and Dean of Admissions Maurice Harris presented the new students to Cantor. The Chancellor encouraged students to learn from and depend on each other, be inspired to achieve things together and be comfortable in being “clueless,” not always knowing the right answer. “I’m extolling the virtues of looking for the answers in non-obvious places and people, and of learning from a diverse community of experts, not just those with demonstrated pedigree,” she said. Students can find examples in the current SU community, in which students and faculty are taking on such issues as bringing justice to Civil Rights Era murders, working to reclaim Onondaga Lake ecology and reinvigorating the Near West Side of Syracuse, all with a contingent of varied community partners. “You have chosen to come to an amazingly diverse, alive, honest, active place—a place that understands what it means to care about the world, about others and to learn by doing,” Cantor said. Professor Timothy Eatman of the School of Education tells students “the ‘Cuse” is a very special place. As they settle into their new homes and community, students were also encouraged by Timothy Eatman, a School of Education faculty member, to become familiar with the addition to their vernacular: the ’Cuse—and what that represents. “The ’Cuse is a very special place. And goodness gracious, are you poised for an amazing journey,” said Eatman, who is also the co-director of the national consortium Imagining America: Artists and Scholars in Public Life based at SU. Eatman recognized Cantor for the ways in which she’s exemplified the best of “the ’CUSE”—courage, understanding, sacrifice and excellence—as she concludes her tenure at SU later this year, before beginning her new role at Rutgers-Newark in January 2014. 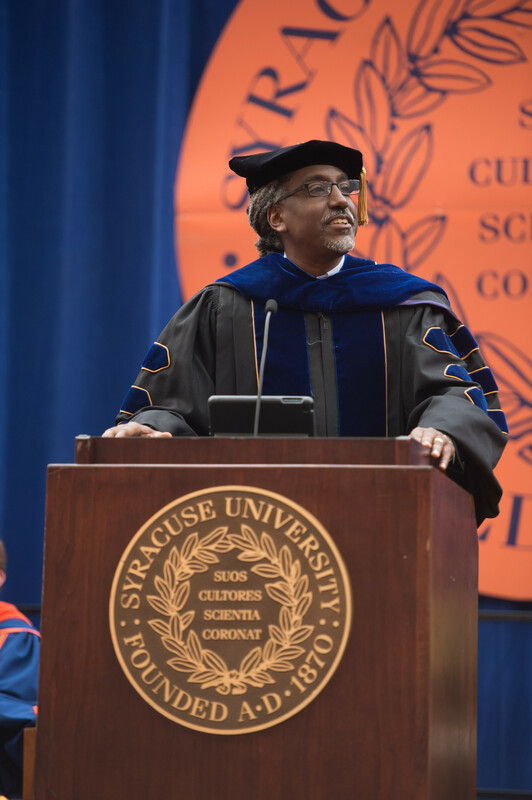 Students can embrace the ’Cuse ideals as they begin their academic career at SU. “Members of the Class of 2017 take courage as you begin this journey. It takes real courage to ask, ‘How can I make the most difference?’ rather than ‘How can I make the most money?’ Courage to pursue work that both pays and matters,” Eatman said. Eatman challenged students to take up Cantor’s earlier words of connecting their degree with something bigger than themselves to nurture their own needs and benefit society. “We must move beyond the often disconnected and less challenging comfort zones of traditional university education models to open up new thinking and channels for creating the world we need,” Eatman said. The event wrapped up with a performance of SU’s alma mater by the SU Marching Band and Jason Kammerer ’14.